Physical Education (PE) is an important part of a child’s education. It provides opportunities for pupils to be creative and competitive individually, in groups and in teams, whilst promoting positive attitudes towards PE and healthy lifestyles. 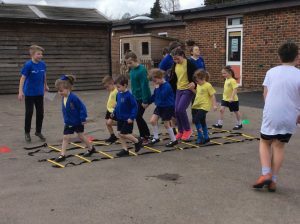 At Nutfield Church (C of E) Primary School, two PE sessions per week are dedicated to physical activity in the curriculum for each class. There are also plenty of other opportunities to take part in sports and PE, both during and outside school hours. The government is providing £300 million per year of sport premium funding to enhance primary sport for the academic year 2017- 2018, and has pledged to do so until 2020. Funding for the academic year from September 2017 to July 2018 for Nutfield Church (C of E) Primary School was increased to £16,000 plus £10 per pupil in Years 1 – 6. We continue to invest the Sports Premium in a variety of ways to improve the quality and breadth of our PE and sports provision and to increase the enjoyment and participation in PE and sport throughout the school, so that all our pupils benefit from the advantages this brings. During the academic year 2016-2017 and so far this year, we have continued to focus on inclusion in PE, sport and outdoor adventurous activities throughout the school. We use the Sports Premium funding to offer CPD opportunities for all staff and we ensure that we have enough equipment and resources to teach a wide range of indoor and outdoor sporting activities. 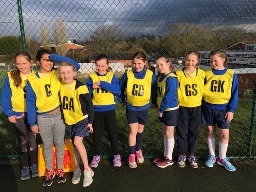 We aim to instill a love of sport and physical activity in our children, and teach them the importance of teamwork in their lives by engaging fully in the local Tandridge District Primary Schools sporting events and tournaments, co-ordinated by Oxted School. 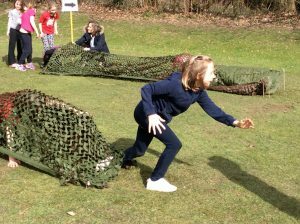 Within Nutfield Church School, we have introduced a full timetable of half-termly inter-school team competitive challenges in a range of different sports and games. 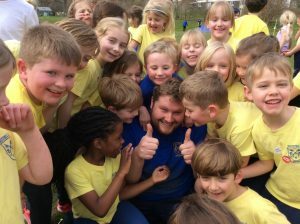 We also plan and organise a number of whole school sports focused days and have close links with several local sporting clubs who send in their specialist sports coaches to train our pupils in sports such as Judo, Cricket and Tennis. On its website, the government provides the following advice for how to spend the Sports Premium funding. Schools must use the funding to make additional and sustainable improvements to the quality of PE and sport you offer. · Lunchtime games introduced with different activities in different areas of playground/field. All teachers using planning for whole range of PE – gymnastics, dance, games and athletics. Reception class use Active8 daily. Football and Athletics after school clubs successfully run with required number of staff members. 16 tournaments attended with supervision by school staff. Residentials staffed with required number of school staff attending. Training for Year 6 Sports Leaders Successful 2 hour training session with lots of ideas for how Sports Leaders can work with younger children. 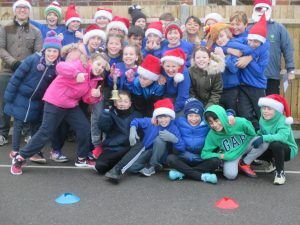 Subsequently children planned and ran 2 whole school sports events and offered daily lunchtime games in the playground. Sports Coaches from outside clubs brought in to offer specialist sports training. (South Nutfield Cricket Club) In all three cases, more children signed up for extra curriculuar sports clubs. Springs Dance Company taught session to Year4. One of the main impacts of the Sports Premium funding is that there is a greater emphasis on PE, sport and outdoors adventurous activities throughout the school. This is evidenced in engaged pupils, trained and competent teachers, the availability of specialist sports coaches, frequent participation in district tournaments and festivals and regular phase, key stage and whole school competitive and fun sporting events. The positive atmosphere engendered by this provision pervades the whole school community and there is a general feeling of ‘can do’ amongst pupils, staff and parents. This is a legacy which the school is building on and will be able to maintain in the future, with or without the availability of extra Sports Premium funding. We intend to use the bulk of the Sports Premium available to us over the next 2 years to purchase and install a Pavilion and associated playground surface adjacent to the current upper playground. The intention is that the Pavilion will provide an outdoor classroom for a range of lessons and will be a particular focus for PE, sport and outdoors adventurous activities. It will sit alongside the current playground area, providing a larger, more versatile area for games and general break and lunchtime playtimes. 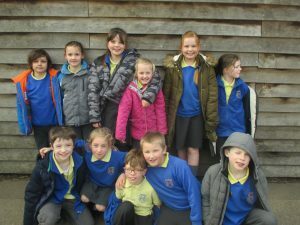 All DP children have 2 hours of PE, sport and outdoors adventurous activities a week as part of their curriculum. 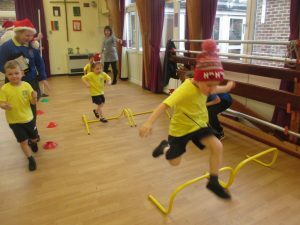 During Spring 2018, they have also had access to daily lunchtime games run by the Year 6 Sports Leaders which are proving very popular with the younger children in school. In the summer term, all children took part in a day of sport with outside Sports Coaches. Years R-3 had Cricket throughout the day, run by Coaches from South Nutfield Cricket Club, based on their All Stars initiative. Years 4-6 had Judo sessions run by the Coaches from Nutfield Judo Club. All DP children in all years have also taken part in a number of whole school sporting events – the Inter-School Team Athletics Competition and Sports Day in Summer 2017, Run XC in Autumn 2017 and Sport Relief in Spring 2018. Further sessions with Sports Coaches from partner clubs are planned for Summer 2018. 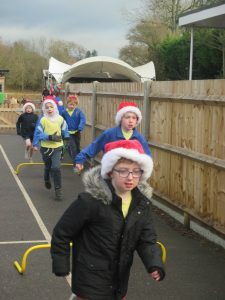 In addition, the children take part in a competitive inter-school team sports challenge once every half term, playing one of the games they have been learning during that term. Points from the challenges go towards Team Points and the School Team Challenge Cup. The following table shows key stage 2 participation by DP children and all children in after school sports clubs and tournaments during the Sports Premium Financial Year 2017-2018. It should be noted that 100% of children also participate in our half-termly inter-school team sports challenges. 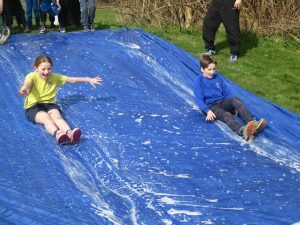 All children have taken part in a number of PE, sport and outdoors adventurous activities in addition to the 2 hours per week of curriculum-based lessons. Summer 2017 – Judo/Cricket taster days. A range of inter-school team competitive sports challenges playing the games they have been learning that term. Coming up in Summer 2018 – Cricket and Tennis lessons run by specialist sports coaches, Inter- School Team Athletics Competition and Sports Day. 12 Tandridge arranged tournaments (organised by Oxted School/some of the primary schools). Nutfield Church School attended 10 of these, with at least one team. Nutfield Church School also organised and hosted the Tag Rugby Festival for Years 3 & 4 in Spring 2017. 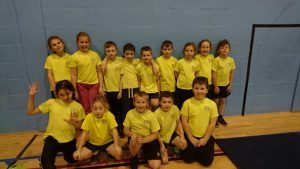 District Sports – Nutfield Church School attended both events with 75 children in all. At the end of each half term, all KS2 children have competed in inter-school team sports competitions in the sport they have been learning during lessons. The children compete in their school teams for points. Scores are gathered and points awarded to each school team. The points are added into the total team points scores for the half term. The winning school team receives an extra ‘Ambassadors’ Playtime, overseen by the Head at the beginning of the next half term. 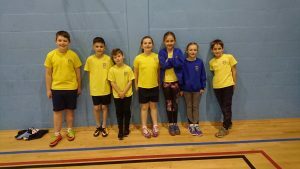 A team of Sports Leaders – 10 children from Year 6 – have been appointed to support other children in the school achieve in PE, to help plan whole school sporting events, such as the Run XC event in Autumn 2017 and Sport Relief in Spring 2018 and run daily lunchtime games in Spring 2018. The PE co-ordinator will be monitoring their impact through review of the events they have organized and feedback from teachers and pupils. Each Sports Leader has an Award Chart where they can add Sports Value stickers to indicate progress in each of the Sports Values. Assisted with resources for Sports After School Clubs. The termly assessment shows good progression across a wide variety of sports and PE disciplines. There is good evidence that the increased focus on PE, sport and outdoors adventurous activities in school has directly impacted on the attainment of children in this area of the curriculum and aided a healthy attitude towards learning in all parts of the school curriculum.